England seized control of the second Test at Old Trafford by bowling out Bangladesh for 216 despite another dazzling century by opener Tamim Iqbal. Tamim hit 108 but England captured all 10 wickets in the final session for a first innings lead of 203. Graeme Swann took 5-76 and debutant Ajmal Shahzad 3-45 to give them the option of enforcing the follow-on. 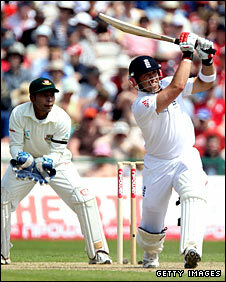 England totalled 419 earlier in the day with Ian Bell making 128 and sharing a stand of 153 with Matt Prior (93). Bell's innings was ended by an absolute beauty from Bangladesh skipper Shakib Al Hasan, which revived memories of Shane Warne's famous ball to dismiss Mike Gatting at the same ground in 1993. The bemused England batsman was squared up and beaten by a delivery which pitched on leg stump and hit the top off and Shakib went on to take 5-121 - but the prodigious turn he obtained should have been a cause for concern for Bangladesh's batsmen, knowing they had to face Swann, the most successful spin bowler in world cricket in the last year. There was no sign of any hesitancy, however, as the charismatic Tamim once again made a flying start, with England seemingly powerless to stem the flow of runs. The 50 came up after eight overs and he had 35 of them, but England finally broke through when Kayes, on 36, top-edged a hook off Steven Finn and debutant Shahzad took a straightforward catch at fine leg. Tamim moved into the 90's with the most delicate of sweeps to the fine leg boundary and went to three figures with a boundary through the off-side, before a bottom edge to a wide one from James Anderson was superbly scooped up by Prior low to his left. Either side of Tamim's departure, Swann, having switched to the Stretford End, found sharp turn and bounce to take the edge of Junaid Siddique, then produced a superb delivery which spun sharply through the defences of Jahurul Islam and knocked back the middle pole. 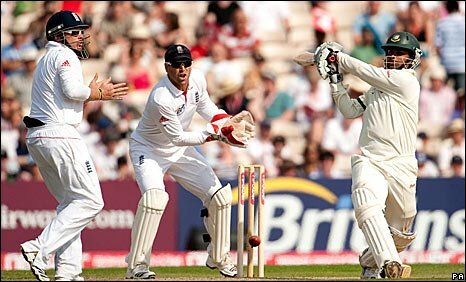 Anderson took a smart catch at slip as Swann, frustrated and wicketless on an unresponsive wicket in the first Test at Lord's, struck again to dismiss Shakib. Mohammad Ashraful, who has not passed fifty since December 2008, became Shahzad's first Test victim when he drove a wide one to gully. The 24-year-old Yorkshireman added the scalp of Mahmudullah and when he found some devastating late away swing to shatter the timbers of Shafiul Islam six were still needed to avoid the follow-on. Swann then secured his seventh five-wicket haul in Tests with a rather fortuitous lbw decision against number 11 Shahadat, leaving skipper Andrew Strauss with a dilemma over whether to bat again with dubious weather forecasted on Sunday, or ask his bowlers to try and polish off Bangladesh. Earlier, England resumed on 275-5 and Bell soon reached his third century against the Tigers in the fifth over of the morning. Partner Prior was some way from his fluent best and was fortunate to survive on 29 when Mahmuddulah failed to reach a top-edged hook as only 45 runs came in the first hour of play. But he broke the shackles with an exquisite reverse sweep when Abdur Razzaq tried to tuck him up outside leg-stump, then fiercely drove the next ball down the ground for four more. England continued to make steady progress until Shakib's moment of brilliance removed Bell, bringing in Swann, who made a bright and breezy 20 before he was pinned on the crease and lbw to left-arm spinner Abdur Razzaq's quicker one just before lunch. Following the re-start, Shahzad drove tamely to extra cover and it looked like Prior might run out of partners in his quest for a third Test century. On 92 he lofted Mahmudullah just short of the onrushing long-on but having survived that he then departed in disappointing fashion to another reverse sweep that went straight to backward point. Shakib trapped Finn lbw first ball for his seventh five-wicket Test haul and when Tamim began dispatching to all quarters, it looked like being Bangladesh's day, but after the drama of the evening session England will be confident they can go on to seal a 2-0 series victory.